Over the years, I’ve had several moles removed. 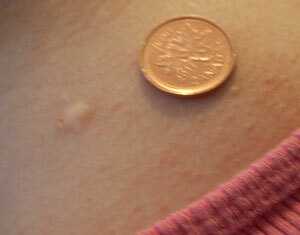 The first two were pre-melanoma, so my family doctor told me that I needed to gradually get them all removed. I’ve had somewhere in the neighborhood of eight or nine moles removed. I have a lot more to go. Between trying to get pregnant, being pregnant, and being busy with my babies, though, it’s been a while since I’ve had any other moles biopsied. Recently, I went to my family doctor about a couple of moles on my arm. One hurt like a painful pimple, then started to bleed a couple of days later. The other one had been changing. Neither of them have even borders or consistent color. I had expected my doctor to look at them and tell me that they are “very bad” and need to come off. He would give me a requisition for a day surgery to get those moles removed and biopsied, and he’d do them himself. His receptionist would call me in a week or two with a hospital appointment time in another week or two. You know, like he had the others. He told me that he was referring me to a dermatologist to take a look at it, as he wanted someone who knew much more about them than he to make determinations as to where we go from there. That worried me. A lot. I got even more worried when I found that my appointment would be in about a month after my consult with my family doctor. The usual wait time for a dermatologist can be close to a year. I’m not sure if the quickness of my appointment is due to the potential severity or because my doctor is buddies with the other doctor (or if even such favors exist here), but it’s going quickly. The simple fact is that sun protection is important. More sun exposure equals more skin damage and an increased risk for skin cancer. I’ve already had more exposure than most would have. Between playing outside as a child, band camp in high school, and studying for college courses on the beach, that’s a lot of non-sunscreen unprotected exposure. In a few weeks, I get to find out how much damage has been done. Don’t make the same mistakes that my parents made or that I continued to make. Use sunscreen and hats to keep your skin and your children’s skin protected. Oh, it was fine. 🙂 Pre-cancerous, but not cancerous.